By its very nature, wine is a drink that suits a large variety of occasions: it can be served as an aperitif, as an ideal accompaniment to a three-course meal, or just for socializing with friends. The color mix spectrum ranges from that of deep, intense reds through to glistening whites with the pinkish blush characteristic of rosé varieties found somewhere in between. The United States produced over 800 million gallons of wine in 2016, nearly 12 percent of the global wine production volume. 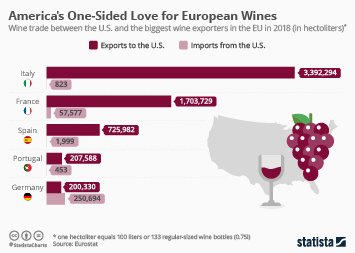 The country's wine production is mainly concentrated in the sun-bathed Golden State of California, which accounted for about 90 percent of entire U.S. wine production in 2017. According to Wines & Vines, there were about 9,654 wineries in the United States as of 2018. Over the past few years, wine sales have held a share of about 17 percent of total alcohol retail sales in the United States. Retail aisles are filled with table wine brands such as Barefoot, Sutter Home and Franzia. America's number one table wine brand Barefoot was sold to the E&J Gallo Winery in 2005. The table wine brand reportedly generated about 665 million dollars in sales in the United States in 2018. Average wine consumption per United States resident was 2.94 gallons in 2016, up from 2.34 gallons in 2005. Americans enjoyed drinking wine more at home than elsewhere: expenditure figures show that on average, U.S. consumers spent about 110 U.S. dollars per year on the wine they consumed at home, compared to about 36 U.S. dollars for wine at full-service restaurants. Among wine drinkers, merlot, chardonnay, and cabernet were the three most purchased varieties. Wine sales & consumption in the U.S.
More interesting topics from the industry "Alcoholic Beverages"